In the first week of November hundreds of the best players around the world will begin arriving in Roseville, Minnesota to participate in the 2015 World Championships. They will compete against each other in thrilling games throughout the week, vying for the honor of being named World Champion, a chance to design a card, and a host of other unique, one-of-a-kind prizes. Today, we reveal what those prizes are, and how players can win them. Back in May, we announced registration for the 2015 World Championships and along with it the participation prize for everyone attending the event. 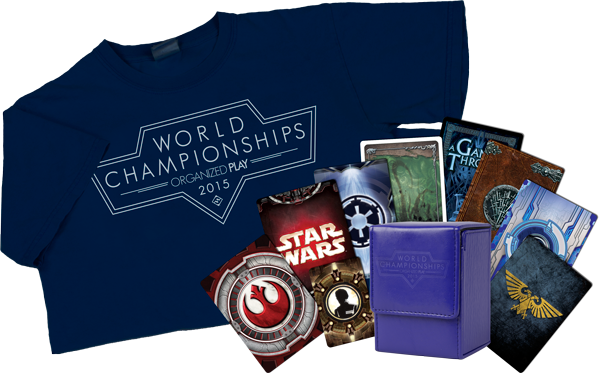 Each person that registered and joins us for World Championships will receive an exclusive 2015 World Championships deck box, a 2015 World Championships T-shirt, and an alternative art card for each of the games being featured that week. In addition to the participation prizes, each game has awesome prizes for those that do well in their Championship events. Click on the event of your choice below to find out what prizes you could win! * The A Game of Thrones: The Card Game Second Edition War of the Five Kings is not a World Championship. The main event prizes are only the tip of the iceberg when it comes to the 2015 World Championships. In the weeks leading up to November, we will be announcing our schedule for live streaming and more!